The body count continues to grow as desperate migrants continue to seek some way to make it to the European continent despite all the obstacles in their peril-strewn way. One can only imagine how hopeless they must be to leave their homes and strike out for European shores if they're willing to abandon any opportunity for a decent life, or just life, and take to makeshift boats to escape the conditions found across their continent. At last report, dozens more of these wretched of the earth had drowned off the coasts of Tunisia and Turkey in a bid to make it across the raging waters that separate them from their goal of a safe harbor. That would be anywhere in Europe, which continues in its efforts to stem this human tide, but not very successfully. 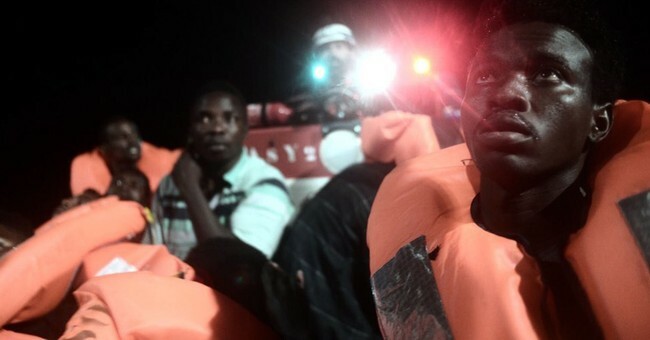 The other day Tunisia's defense ministry announced that at least 46 more migrants had perished off its coast while its forces had rescued 68 others and was doing what it could to save still more. The ill-equipped craft had been loaded to the gunnels with Tunisians and transients of various other nationalities. All they really had in common was the misery that drove them to take to the high seas rather than risk brutal conditions at home. Libya's coast guard said they were all hoping to establish a beachhead at Sicily, but hope was no match for all the forces arrayed against them. Turkey's coast guard announced that just the other day nine more bodies of migrants who hadn't made it across the Mediterranean had been recovered while four others had been plucked alive from the sea. A fifth was saved by a passing fishing vessel and the grace of God -- but every passing day is bound to bring more mixed news. Stay tuned for more such developments if you can bear it. According to the United Nations, for whatever good it does, at least 600 migrants have died trying to cross the Mediterranean through the first quarter of this year alone, with 22,439 of them managing to arrive safely on European shores. But from that point their troubles may only have begun as they attempt to make it through the maze of border barriers that various countries have erected against them. Oh, what stories they'll have to tell their children and grandchildren, provided they somehow make it. My mother, who was born across the sea in the midst of the one great battlefield eastern Europe had become between the two great wars, remembered standing in the long, long line before the American embassy in Warsaw using the rubber heel of her shoe to change her papers in response to each rumor that came floating down the line: One day American customs was going to admit only immigrants with a trade; the next, there would be no visas at all for prospective immigrants unless they could prove they wouldn't be a burden on society. And she was one of the lucky ones who had papers to alter in response to every change of the political and social headwinds. Today would 19-year-old Sarah Ackerman be dismissed as an undocumented immigrant and told to go back to where she came from? Wherever that was. Different times, different standards, and yet all bear an uncanny resemblance to the other for the driven of the earth. Welcome to the same old same old that is the migrants' forbidding world.